This unfinished Wenge engineered wooden flooring has a dark chocolate brown top layer which is 6mm thick and bonded onto 14mm stable plywood backing, making this hardwood floor very structurally stable. These floors are so stable that they are the only credible wooden floor for laying over underfloor heating. Our engineered hardwood floors are unfinished but pre sanded and once installed are indistinguishable from solid versions and without solid woods inherent movement problems. Our engineered floors can be laid directly to concrete and timber subfloors and also nailed to spanning joists. 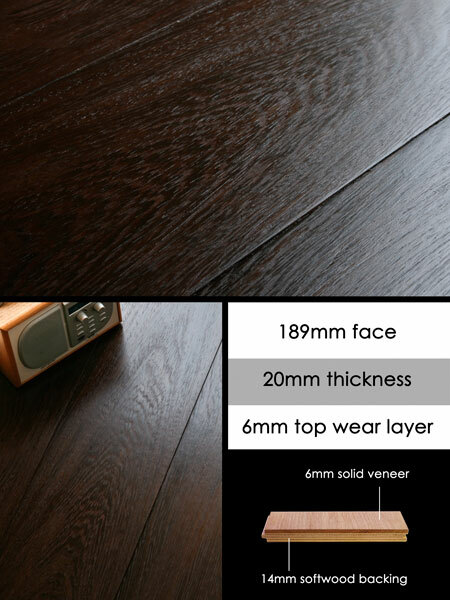 * Thick 6mm or 4mm Wenge top layer. * Suitable for underfloor heating.